Byron bay real estate is entering a boom period. The amount of days property is staying on the market has been slashed with an average sale period lasting 40 to 45 days, compared to 90 to 120 days in 2012. McGrath Byron Bay expert Nick Dunn says Byron Bay is experiencing its first growth period since the global financial crisis with buyer demand, price growth and rental return levels not seen since 2007. He attributes this to its lifestyle, limited supply and low interest rates coupled with an overall growth in the Sydney market. The average price of a Byron Bay house is currently $812, 500 up from the global financial crisis low of $649, 000 in 2008. Rental returns reaching 5.5 per cent gross yield is one positive growth sign that has investors keeping an eye on the market. McGrath report every Australian capital city experienced capital growth in January. This is the first time since the global financial crisis that the capital cities have experienced simultaneous growth. The report suggests that a large percentage of Byron Bay buyers are made up of pre-retirees who buy property with the intention of renting it out first, then moving in themselves in the future. The cities growth coincides with the introduction of a new residential subdivision. 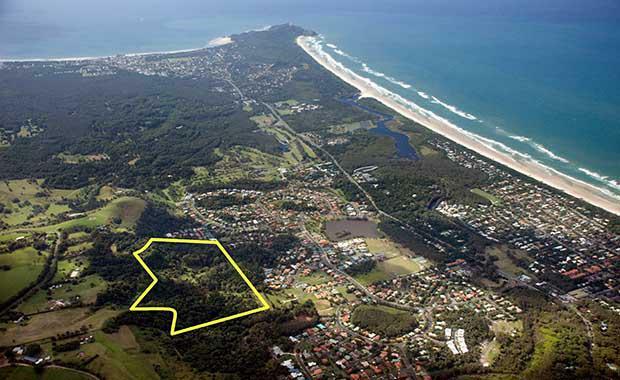 Seacliffs will be the first new residential subdivision in Byron Bay in fifteen years. Brisbane-based Unison Projects will oversee the development with 33 large elevated lots located minutes from the beachfront and town centre. Seacliffs will comprise of 16 hectares with 73 per cent of the land remaining as a private rainforest. Stage one is commencing with 11 parcels ranging from 718 square metres to 1063 square metres. Prices will start at $485, 000.